The sorrow over losing two dogs within a few months of each other was so overwhelming that Julie Stafslien couldn’t imagine finding a place in her heart for another dog. Ever since she was a child, though, there had always been a canine family member, so it didn’t seem right not to have one. Half a year passed before she figuratively stuck her toe back in the water and began to consider adopting one. About then, she also discovered Petfinder. Nothing beats snoozing on a lap in a lounger. “The only parameters we had were to avoid very large dogs (our house is very very tiny! ), dogs that do not do well with cats (we have two couch potatoes) and breeds that are prone to barking at their own shadows,” the Viroqua, Wisconsin, woman says. She and her husband, Scott, were also hoping to adopt a Shetland Sheepdog, the breed of one of their late dogs. She felt sure when they saw the right dog, they would know. And that’s what happened. A sweet little face popped up on their monitor. 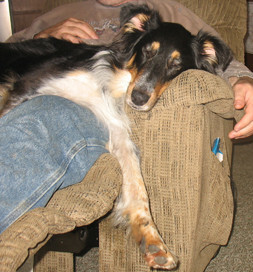 Bella, a Sheltie, had been rescued from an abusive situation, emaciated and full of fleas. Now that she was at Barron County Humane Society, she was recovering nicely, but was very timid. Since that day, Bella has lived like a princess. The Stafsliens take her to doggy day care one day a week for some playtime with four-legged friends, and when she arrives home, she scrambles into Scott’s lap for a massage. They also spend time playing fetch and hide-and-seek with her. Trips to the park round out her days. It’s a good life for a dog that was once neglected. Hearts do have a way of expanding for love.